When sound crosses the boundary between two materials it can reflect or refract, just like light changes direction when it goes into glass, for example. This can even happen if the two materials are the same crystal, provided that the crystal axes are pointing in different directions. 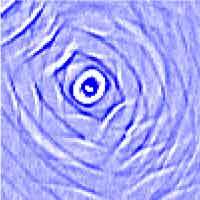 Now we have been able to visualize this happening experimentally by watching ripples passing between two crystallites. The sample we use is made up of copper crystallites. 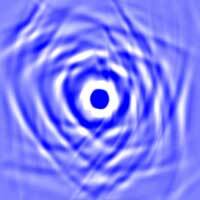 Their orientation can be imaged using electron diffraction, as shown in the figure below. 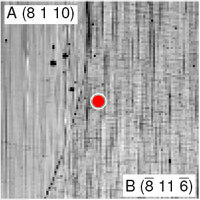 Electron diffraction image of the surface of the polycrystalline copper specimen. This image shows the surface of a polycrystalline copper specimen that is colour coded according to the different crystallite orientations. We study surface acoustic waves travelling from crystallite A to crystallite B and vice versa. Because copper is highly elastically anisotropic, the surface acoustic waves are refracted strongly as they cross the interface between the two crystallites. Animations of a 200 micron square region are shown below when the optical generation of the surface acoustic waves is on the left- or right-hand side of the grain boundary. 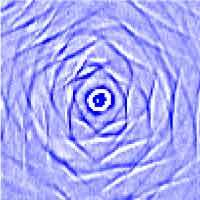 Experimental images (blue) for surface acoustic waves travelling across a copper grain boundary. To animate click the images (360 kB). 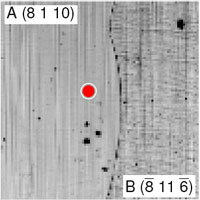 The position of the grain boundary can be seen in the black-and-white photographs, and the optical source position is marked in red. In collaboration with the group of Shin-ichro Tamura of our department we have modelled these surface waves, as shown below. Theoretical simulations. To animate click the images (340 kB). We can also look to see what happens under the surface. Theoretical simulations. To animate click the images (200 kB). 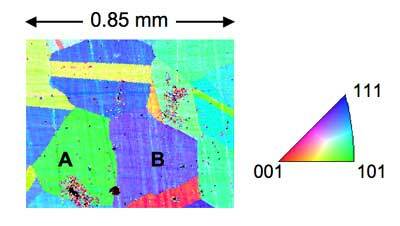 We hope this work will stimulate more studies on yet more complicated crystal boundaries. Remember that copper is a relatively simple cubic crystal. 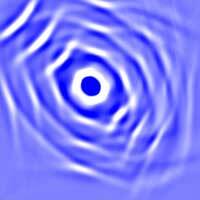 What would surface waves travelling between two different crystals look like, one wonders, for example? Further details of this work can be found here ('Time-resolved surface acoustic wave propagation across a single grain boundary', D. H. Hurley, O. B. Wright, O. Matsuda, T. Suzuki, S. Tamura and Y. Sugawara, Phys. Rev. B 73, 125403 (2006)).